Invests in banks deposit and short term debt instruments such as certificates of deposit and fixed rate bonds. 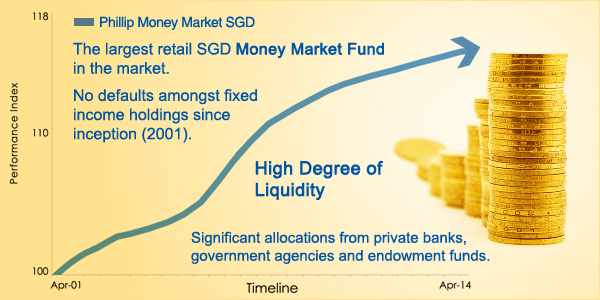 Why Phillip Money Market Fund? How To Invest into Phillip Money Market Fund? This is a service provided by Phillip. It allows your excess funds work harder for you while you wait for your next investment. It is available in both SGD and USD. All you need to do it to opt in to this facility by giving a one-time authorization. This can be done at account opening or via online POEMS trading portal. Once you opt in, excess funds in your trading account with a minimum balance of SGD100 will be automatically invested into Phillip Money Market Fund.